Summary and Definition: The Seminole people descended from the ancient mound builders located in the Mississippi River valley and the Creek Native Indians. They settled in Alabama and Georgia but made their way further south into Florida. These bands of former Creeks were joined by runaway slaves and became known as the Seminole tribe. Famous chiefs and leaders of the Seminole people included Osceola and Billy Bowlegs. What was the lifestyle and culture of the Seminole tribe? The ancestors of the Seminole people were either among the indigenous tribes who lived in Florida or members of the Creek confederacy living in Georgia and Alabama. The people in Florida adapted to the climate and geography of the area and lived in houses built on stilts called Chickees. Those who had settled in Georgia and Alabama lived a similar lifestyle to the Creeks as hunters and farmers, living in villages of wattle and daub houses and wearing breechcloths made from deer skin or bark fabric. Their numbers diminished due to the diseases brought by the Europeans including the Spanish, French and the British. The Creek Confederacy were allied to the British colonies during the French and Indian Wars (1688-1763). Close contact and trade with the colonists led to the establishment of strong cultural ties between the Creek and the newcomers. The Native American Indians began to adopted the European style dress and log-cabin houses. The white encroachment of their lands in Alabama and Georgia led to the conflict known as the Creek War (1813–1814). Many Creeks fled to the former territory of the Apalachee in Spanish Florida. It was at this time that the people began to be referred to as the Seminoles. (The name 'Seminole' means "separatist"). The Seminoles were joined by black runaway slaves, to whom they gave refuge. The Seminole and the escaped slaves were seen as a threat to Georgia, which led to the 1818 raid on Florida by General Andrew Jackson, sparking the start of the First Seminole War (1817-1818). The Adams Onis Treaty was made in 1819 by which Spain sold Florida to the U.S. for $5,000,000. The Treaty of Fort Gibson was signed by which the Seminole people relinquished all claims to land in the Florida Territory. In 1832 about 3,800 Seminole people were forcibly removed to Indian Territory and organized into the "Seminole Nation" and became one of so-called "Five Civilised Tribes." Billy Bowlegs and Chief Osceola became the leaders of a Seminole resistance movement against their forced re-location to Oklahoma, and the Second Seminole War erupted. The Seminole were eventually forced to surrender and were required to move to Oklahoma where they were resettled in the western part of the Creek reservation there. A few Seminole remained in Florida. Where did the Seminole tribe live? The Seminole are people of the Southeast Native American cultural group. The geography of the region in which they lived dictated the lifestyle and culture of the Seminole tribe. 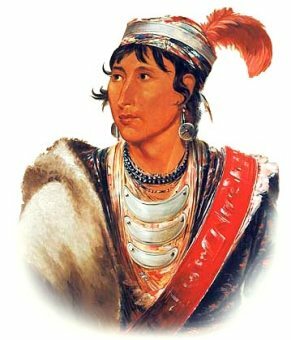 What clothes did the Seminole wear? The early clothes worn by the Seminole men consisted of breechclothes and deerskin clothing. 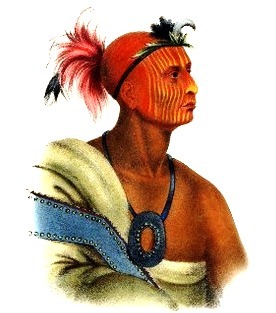 The warriors wore face and body paint, tatooes and a scalp lock with a roach style headdress adorned with feathers as can be seen in the picture of the Seminole Chief, Tuko-see-mathla. By the 1800's the Seminole were greatly influenced by the American style of dress and the availability of trade cloth. The men wore buckskin leggings and a cloth, smock-like shirt with a matchcoat which extended to well above the knees. It had long sleeves fastened tightly at the wrists, and sashes which were fastened about the waist or across the shoulder. The turban style headdress was worn by many of the southeastern tribes and made with strips of calico cloth wrapped around the head like a headband or turban adorned with a plume. What did the Seminole tribe live in? The Seminole tribe lived in different styles of houses depending on the time period and their location. The ancestors of the Seminoles living in Alabama and Georgia lived in Wattle and Daub Houses. These homes were built using a frame of poles and beams covered with wattle and daub mud. The walls were then covered by cane mats and a thatched grass roof. The early Seminole in Florida lived in stilt houses called chickees. The Chickee stilt houses had no walls, they consisted of thick posts supporting a palmetto-thatched roof and a flat wooden platform raised several feet off the ground and built along marshes, river banks and waterways. 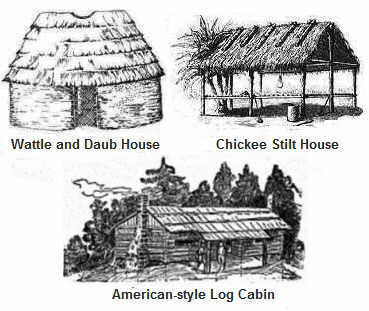 As time passed the Seminole lived in American style log cabins and houses. What language did the Seminole tribe speak? The Seminole tribe spoke in several related dialects of the Muskogean language family. They refer to themselves as "Red People," or "Istica-ti" in Muskogee. What did the Seminole tribe eat? The food that the Seminole tribe ate included included wild turkeys, rabbits, deer (venison), fish, turtles, and alligators. Their staple foods were corn, squash and beans supplemented with wild rice, mushrooms, pumpkins and plants. As time passed the Cherokee began raising cattle and hogs that they acquired from Europeans. What weapons did the Seminole use? The weapons used by the Seminole included, war clubs, knives, gunstock clubs, bows and arrows, spears and axes. The Europeans introduced muskets and then rifles. Seminole History: What happened to the Seminole tribe? The following Seminole history timeline details facts, dates and famous landmarks of the people. The Seminole timeline explains what happened to the people of their tribe. 1819: The United States acquired Florida from Spain via the Adams Onis Treaty by which Spain sells Florida to the U.S. for $5,000,000. 1832: About 3,800 Seminoles were forcibly removed to Indian Territory and organized into the "Seminole Nation" and became one of so-called "Five Civilised Tribes." 1833: The Treaty of Fort Gibson was signed by which the Seminole people relinquished all claims to land in the Florida Territory. 1842: The Seminole tribe was forced to surrender and required to move to Oklahoma where they were resettled in the western part of the Creek reservation. A few Seminoles remained in Florida.